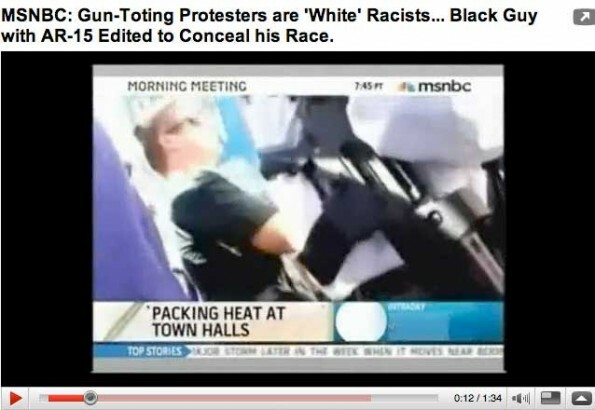 Close-up still frame shot on msnbc MORNING MEETING of ‘man’ legally carrying a semi-automatic assault rifle at Obamacare protest. Still frame of the widest angle shot used during msnbc MORNING MEETING of ‘man’ legally carrying a semi-automatic assault rifle at Obamacare protest. 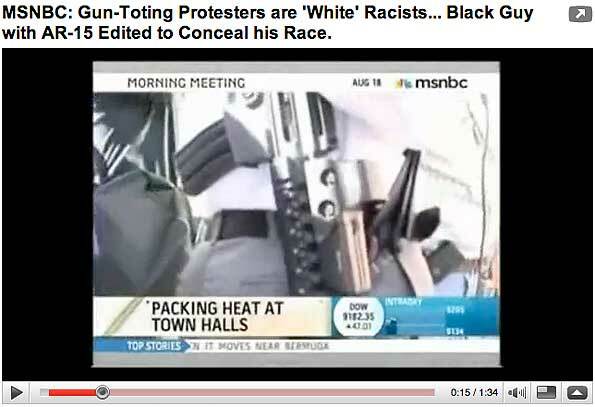 Sill frame image from ABC 15 News Phoenix of the black male that was legally carrying a semi-automatic assault rifle at an Obamacare protest — a wide-out shot that MSNBC never showed. 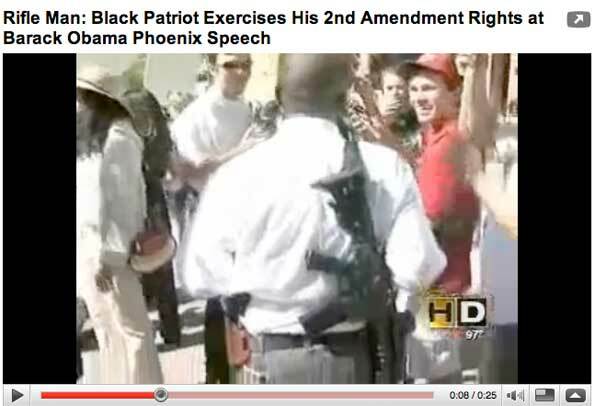 On August 17, 2009 an unidentified black man carried an AR-15 semi-automatic rifle during an ObamaCare protest outside of the Phoenix Convention Center in Arizona. At a safe distance, President Barack Obama was speaking to Veterans of Foreign Wars for a health care reform rally. Here’s what she brewed up: “The reason we’re talking about this — a LOT of talk here, Dylan [Ratigan] — cause people feel like — ‘Yes, there are Second Amendment Rights’ for sure, but also there are questions about whether this has a racial overtones (sic) — I mean — here you have a man of color in the presidency and there’s white people showing up with guns strapped to their waist, or onto their legs. Opposed to Obama’s health care plan — a black man who expressed his right to legally carry a rifle and a handgun in Arizona. Sort of like ‘Never bring a knife to a gunfight’ only in reverse: ‘Never bring a gun to a peaceful political rally about health care’ because you give might give MSNBC an opportunity to totally misrepresent the truth. Contessa Brewer graduated from Sacopee Valley High School in Hiram, Maine in 1992. She joined MSNBC in September 2003 after working for WTMJ-TV in Milwaukee, Wisconsin.